Veteran Polish match racer and America’s Cup helmsman Karol Jablonski skilfully played the gusty conditions today to lead the twelve strong field of teams at the end of Day 2 of Qualifying at the 2015 Energa Sopot Match Race. The Sopot regatta is Stage 10 of the 2015 World Match Racing Tour and one of six World Championship level events on the ISAF sanctioned World Tour. Jablonski leads the field with an 9-2 [win-loss] scoreline with three flights remaining in Qualifying. The two Swedish skippers Björn Hansen and Johnie Berntsson lie in joint second position with 7 wins each. Danish skipper Nicolai Sehested and his Trefor Match Racing team, competing in his first Tour event this year, sits just one point behind with 6 wins. Jablonski, 52, is the oldest skipper competing in the event (much to the delight of 48 year old Bjorn Hansen), but as a former ISAF Match Racing World Champion and America’s Cup skipper (not to mention a nine-time World Ice Yachting Champion), Jablonski revelled in the blustery conditions today to remain one of the favourites for the event. “We had a tough day at the office but we are very happy with the result” commented Jablonski. “My team has done an incredible job here handling the boat in these tough conditions, and bringing us back whenever we have been behind. To sail so well in our home waters is also a great promotion for sailing in Poland, we need events like the Energa Sopot Match Race in Poland." 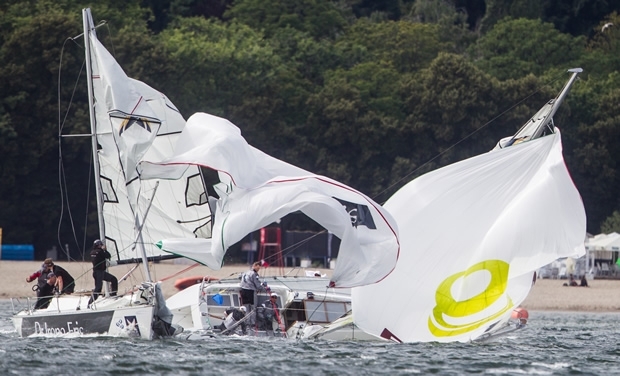 But it was 25 year old Australian David Gilmour of Team Gilmour who was dealt the unfortunate gust of the day resulting in his mast snapping clean in two during a close downwind battle against defending ISAF World Champion and GAC Pindar skipper Ian Williams . As the two teams headed to the finish line on the last leg of their race, a freak gust threw Williams’ boat into a Chinese gybe forcing his spinnaker to apparently clip the backstay of Gilmour’s boat. As Gilmour fought to keep his boat steady, the mast snapped above the spreaders and fell forward to the deck. Williams was able to right his boat and take the win as Gilmour limped his boat back to the marina.